Love it, hate it, or occasionally vomit because of it, you have to admit that Mirror's Edge was one of the more interesting games of the last few years. And now it's coming to the iPhone. 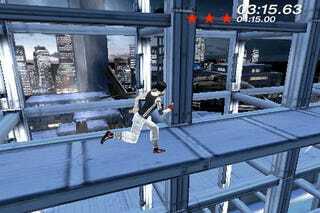 If you don't have any idea what I'm talking about, here's Mirror's Edge in a nutshell: Parkour, with bullets. Which is an unusually hearty mix! The few early screens show what looks like a 3D sidescroller/platformer, which means that the iPhone version is a sort of hybrid game, somewhere between the original and the fantastic 2D Flash version that EA posted for free. Either way: awesome.